On the beautiful beach of Kolymbari, 20 km from the city of Chania, lies Giannoulis – Grand Bay Beach Resort – Adults Only. The resort boasts an outdoor hot tub. The resort offers 75 airy and well appointed rooms and suites fully equipped with satellite TV and minibar. All units offer balconies with views to the garden or the sea. Greek breakfast is served daily in the dining area. Guests can dine at the snack bar or the hotel’s restaurant. At the swimming pool bar and main bar they can enjoy a drink, a coffee or refreshments. Transfers by taxi can be arranged at extra charge. Located in the village of Rapaniana, in Kolymvari, just 20 km west of Chania. Guests at this hotel will enjoy an array of opportunities to explore the cultural and historical delights that the area has to offer. Guests will find themselves located amidst wonderful, natural beauty, a mere 100 metres from the shimmering delights of the sea. Guests can enjoy breath-taking sights of numerous canyons, lakes and rivers from this captivating location. The guest rooms are elegantly appointed, featuring soothing, tranquil tones, and modern furnishings, allowing guests to completely relax and unwind. The hotel provides guests with a number of excellent facilities, catering to the needs of even the most discerning traveller. Enjoy Mediterranean cuisine at Basilico, one of the hotel's 5 restaurants, or stay in and take advantage of the room service (during limited hours). When you are in need of a refreshing drink, visit the beach bar or one of 4 bars/lounges, or 2 poolside bars. A complimentary hot/cold buffet breakfast is served daily from 7:30 AM to 10:30 AM. With a stay at Aphea Village in Platanias, you'll be near the beach, within a 15-minute drive of Platanias Beach and Orthodox Academy of Crete. This hotel is 19.4 mi (31.2 km) from Balos Beach and 14.1 mi (22.7 km) from Golden Beach. With a stay at Irinoula Dreams in Platanias, you'll be near the beach, within a 15-minute drive of Platanias Beach and Orthodox Academy of Crete. This aparthotel is 6.6 mi (10.6 km) from Agia Marina Beach and 11.2 mi (18.1 km) from Golden Beach. 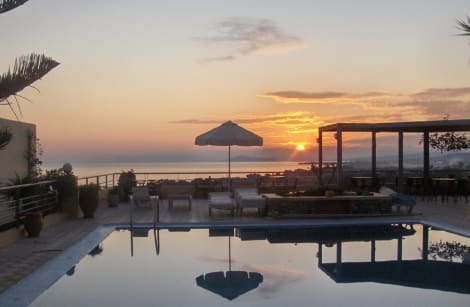 With a stay at Selini Suites in Platanias, you'll be near the beach, within a 15-minute drive of Platanias Beach and Orthodox Academy of Crete. This 4-star hotel is 7.1 mi (11.4 km) from Agia Marina Beach and 11.8 mi (18.9 km) from Golden Beach. 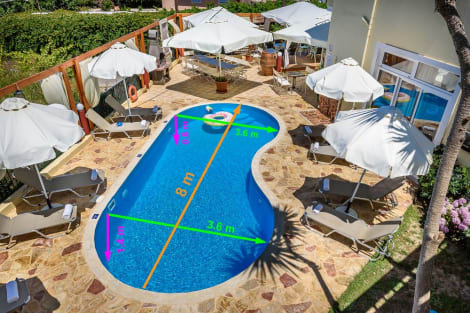 With a stay at Iliaktida Apartments in Platanias, you'll be 6.3 mi (10.2 km) from Platanias Square and 6.8 mi (11 km) from Agia Marina Beach. 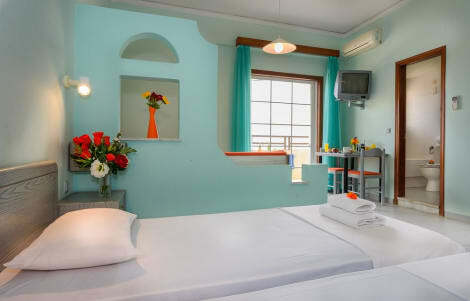 This aparthotel is 14.6 mi (23.5 km) from Chania Lighthouse and 19.5 mi (31.4 km) from Falassarna Beach. Make yourself at home in one of the 22 air-conditioned rooms featuring kitchenettes with refrigerators and stovetops. Rooms have private furnished balconies. 32-inch LED televisions are provided, with satellite programming available. Conveniences include safes and coffee/tea makers, and housekeeping is provided daily. The villas are located in Skoutelonas, a quiet area with rich nature surrounded by lush gardens and trees. The fishing village of Kolymbari is only 1.5 km away and it offers numerous restaurants and bars. The picturesque town of Chania is 20 km away, Platanias is some 8 km away and it is around 35 km to Chania Airport. This modern finca comprises 8 villas. Garden terraces surround the buildings and there are parking spaces available. The villas are luxurious, spacious and well-lit. They are decorated in bright colours and equipped with modern facilities, such as an en suite bathroom with shower, a private balcony or a terrace, individually regulated air conditioning and heating and a kitchen with fridge, cooker, microwave, tea and coffee making facilities and a washing machine. A hairdryer, TV, safe, wireless Internet access, a double bed and an ironing set also feature in all rooms as standard. Each villa also has its own private swimming pool There is a nearby sandy/pebble beach. The finca offers all-inclusive packages. lastminute.com has a fantastic range of hotels in Kolymbari, with everything from cheap hotels to luxurious five star accommodation available. We like to live up to our last minute name so remember you can book any one of our excellent Kolymbari hotels up until midnight and stay the same night.